The Clean Money Year in Pictures — 2017! 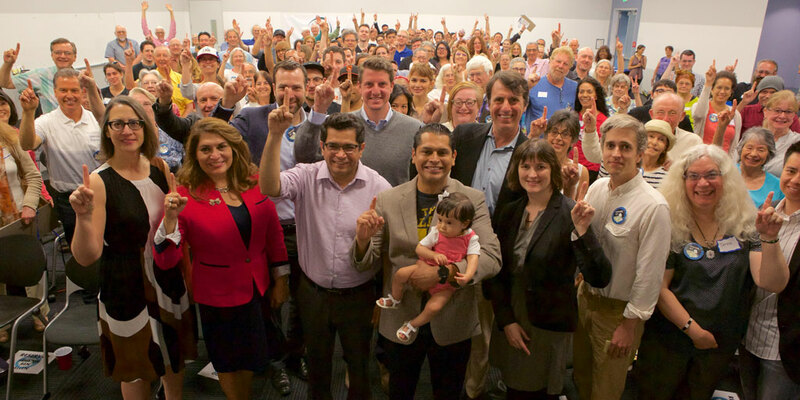 Clean Money supporters at our autumn Clean Money Grassroots Summits in Southern California (at top) and Northern California (Assemblymembers Catharine Baker and Tim Grayson are to the right of Clean Money President Trent Lange in the center). Join our winning fight against Dark Money! Monthly Clean Money members helped us achieve victory passing the California DISCLOSE Act! In 2017 the Washington DC "swamp" was not drained. True, a national DISCLOSE Act was reintroduced and there is a bipartisan effort to pass an Honest Ads Act. But this Congress has mostly been going in the wrong direction, including even considering taking the unthinkable step of repealing the Johnson amendment to politicize churches and allow wealthy special interests to receive tax deductions on Dark Money! Yet with last year's historic passage of AB 249, the California DISCLOSE Act, California is leading the way against secretive Big Money in politics. And that's just the beginning — thanks to Clean Money supporters like you and our coalition partners! A great way to tell the story of Clean Money's series of hard-won victories in California in 2017 is with pictures at major turning points! In the images below we refer to both AB 249 and AB 14. The California DISCLOSE Act started 2017 as AB 14, authored by Assemblymembers Jimmy Gomez and Marc Levine. After Assemblymember Gomez went to Congress it became AB 249, authored by Assembly Speaker pro Tem Kevin Mullin and Assemblymember Levine — then passed the legislature and was signed into law by Governor Brown. We hope you enjoy these photos of our nation-leading California DISCLOSE Act victory. Nearly every step of the way was a nail-biter, with progress only happening after huge outpourings of grassroots activism from Clean Money supporters like you shown below. And it all built on our major progress in 2016, because we keep coming back! 2017 began with record crowds at Women's Marches and other "resistance" marches all around the state and nation. 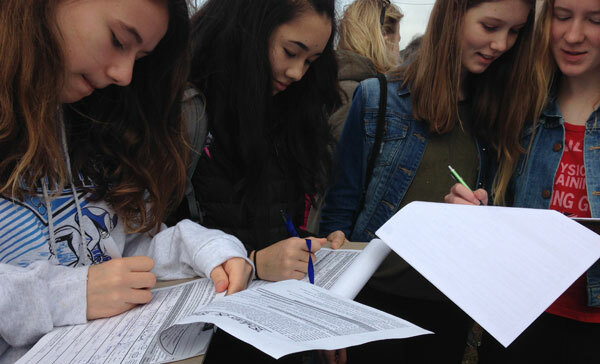 We took advantage of the huge opportunities — and in only one day at 25 different Women's Marches around the state, Clean Money volunteers gathered a record 7,000 signatures for the California DISCLOSE Act (including the four signatures above in Oakland!). In 2017 volunteers gathered an incredible 49,404 paper signatures for AB 14 and AB 249, a strong driver of our historic victory and of the tremendous growth in our activist base for future attacks on Big Money. 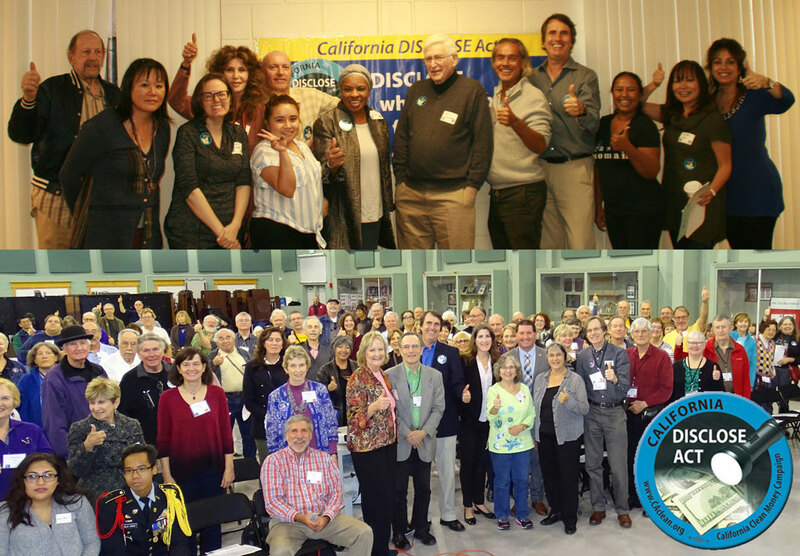 The campaign for the California DISCLOSE Act in 2017 started off with a packed house at the campaign kickoff for AB 14 (Gomez-Levine) in Los Angeles. In the front row are speakers at the event: Coauthors Assemblymembers Laura Friedman and Sharon Quirk-Silva, AB 14 author and then-Assemblymember (and now Congressmember) Jimmy Gomez, Assemblymember Miguel Santiago, Sandra Fluke of Voices for Progress, Will Eley of CALPIRG, Teresa Priem of People Demanding Action, and Mike Young of California League of Conservation Voters. In the second row are principal coauthors Senators Ben Allen and Henry Stern, and Clean Money President Trent Lange. 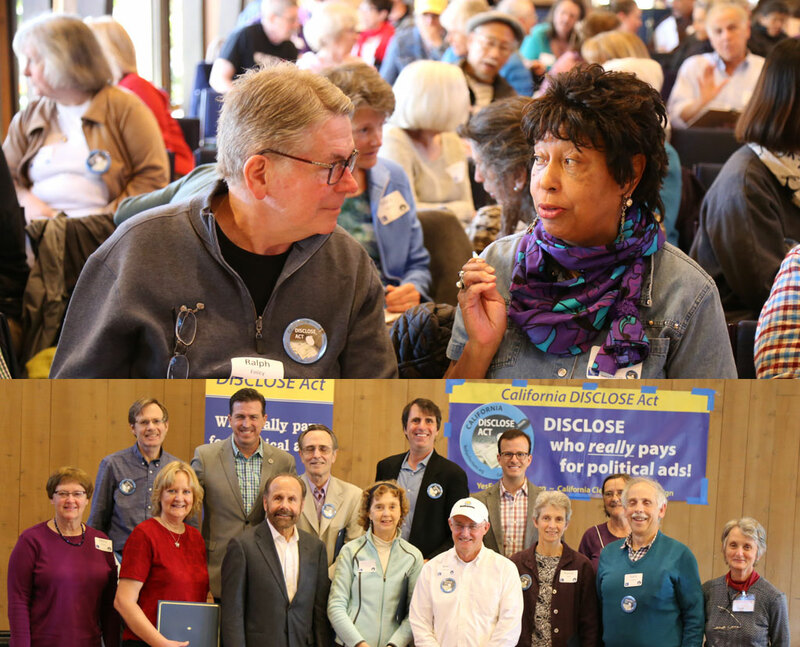 Clean Money grassroots leaders and activists from all around Northern California gathered at our all-day summit in Palo Alto for detailed planning of the campaign for AB 14. In the top photo, part of the crowd is engaged in discussion, and long-time activists Ralph Finley and Diedre Booker are in the foreground. Below that are people being recognized as 2016 Clean Money Champions for their tremendous grassroots activism or legislative leadership. In the front row from left to right are: Mary Linton, Shirley Shelangoski, Senator Jerry Hill, Mary Gill, Robert Ward, Nancy Neff, Gary Appell, and Donna Poulos. In the second row are: David Schmidt, AB 249 author Assembly Speaker pro Tem Kevin Mullin, Craig Dunkerley, CCMC President Trent Lange, Assemblymember Marc Berman, and Elaine Elbizri. Senator Russ Feingold speaks at Clean Money Fundraiser on May 21! Former Senator Russ Feingold, a national campaign finance reform champion, boosted our effort to pass the California DISCLOSE Act by headlining a fundraiser at the lovely home of Alice Smith in Palo Alto. Senator Feingold has been a longtime champion of the DISCLOSE Act, and his organization LegitAction was a key coalition partner in passing AB 249 later in the year. Also speaking were Congressmember Ro Khanna, Santa Clara County Supervisor Joe Simitian, and CCMC President Trent Lange. The majority of California Clean Money Action Fund donations in 2016 were $10 or less, but many of the 151 attendees at the fundraiser gave generously enough that, along with others, they increased our average donation to $28. Truly, regular people's small donations power Clean Money! Rally & Lobby to "Give DISCLOSE a Vote!" on Capitol steps on June 14! In just one example of the grave challenges we faced to pass the California DISCLOSE Act, AB 14 didn't get its promised hearing at the June 14th Assembly Elections Committee. So, over 150 Clean Money supporters lobbied Assemblymembers and rallied on the Capitol steps to demand a vote! Speaking in the photo is principal coauthor Senator Ben Allen. Also speaking were: principal coauthor Senator Jerry Hill, coauthor Assemblymember Matt Dababneh, Freddie Quintana from the office of AB 14 author Assemblymember Jimmy Gomez, Nicolas Heidorn of California Common Cause, Mark Carlson of the Lutheran Office of Public Policy, Jason Pfeifle of CALPIRG, Lauren Windsor of American Family Voices, Roza Calderon, and Clean Money's own Trent Lange, D'Marie Mulattieri and Logan Smith. Our voices demanding a vote were heard loud and clear, literally resonating through the Capitol. 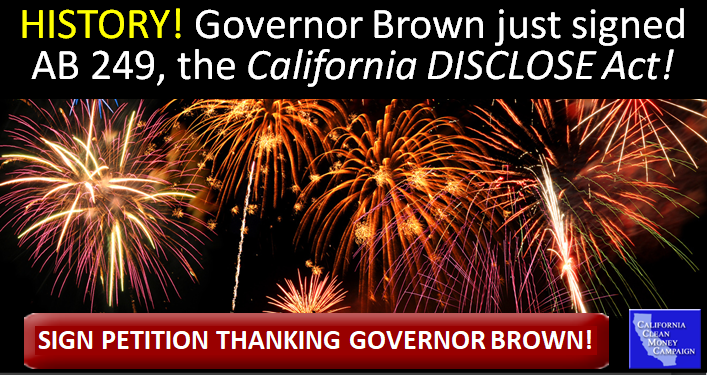 SB 651, the Petition Disclosure Act, passes Assembly Elections on July 12! Though the California DISCLOSE Act was our primary focus in 2017, the California Clean Money Campaign also sponsored another important bill: SB 651, the Petition Disclosure Act, authored by Senator Ben Allen. SB 651 is a logical extension of the DISCLOSE Act because it requires paid signature gatherers asking you to sign initiative petitions to tell you their largest funders. This can stop stop bad initiatives from getting on the ballot that mislead voters about who's really behind them. SB 651 passed the Assembly Elections Committee in a bipartisan 5-0 vote after the committee received hundreds of emails and heard spirited testimony from the Clean Money supporters (shown above) and coalition partners. Later, it passed the Assembly Appropriations Committee in a vote of 10-5. Then we made it a two-year bill so we could focus on passing the DISCLOSE Act. In 2018 we plan to finish passing SB 651 with your help! Senate President pro Tem Kevin de León gives AB 249 its new author, Assembly Speaker pro Tem Kevin Mullin on July 19! Senate President pro Tem Kevin de León along with Clean Money President Trent Lange and ecstatic Clean Money activists after he gave us the good news. After AB 14 author Assemblymember Jimmy Gomez went to Congress, the California DISCLOSE Act needed a new author and bill number. This was a perilous time. More than 3,000 Clean Money supporters called Senate President pro Tem Kevin de León before the final Senate Rules Committee hearing that could affirm Assembly Speaker pro Tem Kevin Mullin as the new author in time to give it a realistic chance of passing in 2017. Senator de León led by granting Assemblymember Mullin authorship, and by publicly vowing to work with stakeholders to get AB 249 passed! 2nd "Give DISCLOSE a Vote!" rally ends with AB 249 getting scheduled for its first vote! Aug 23. Senate President pro Tem Kevin de León worked with new author Assembly Speaker pro Tem Kevin Mullin, us, and stakeholders to allow AB 249 to get back on track. Leaving nothing to chance, over 100 Clean Money supporters rallied on the day of the Senate Rules Committee and were greeted by Assemblymember Mullin (above) announcing that in the following week it would have its Senate Elections Committee hearing and vote! Other speakers at the rally included: AB 249 joint author Assemblymember Marc Levine, newly announced principal coauthor Senate President pro Tem Kevin de León, original principal coauthors Senators Ben Allen, Henry Stern, and Jerry Hill, and coauthors Assemblymembers David Chiu, Laura Friedman, and Sharon Quirk-Silva, plus CDP Women's Caucus Chair Christine Pelosi, CDP Chicano-Latino Caucus Vice Chair Norma Alcala, and CCMC President Trent Lange. AB 249 passes Senate Elections Committee on 8/29! AB 249 author Assembly Speaker pro Tem Kevin Mullin, CCMC President Trent Lange, and some of the 120 Clean Money supporters who packed the Senate Elections Committee. When AB 249 finally had the vote in the Senate Elections Committee we'd been demanding for the last several months, over 120 Clean Money supporters testified and the bill passed 4-1! We immediately dispersed and lobbied senators and their staff to vote "Yes". Three days later, AB 249 flew through the Senate Appropriations Committee in a 5-2 vote on September 1st. AB 249 passes Senate on overwhelming bipartisan vote of 29-9 on 9/11! AB 249 Senate floor manager Senator Ben Allen, Clean Money President Trent Lange, and AB 249 author Assembly Speaker pro Tem Kevin Mullin huddle outside Senate chambers on the day of the final Senate floor vote, along with their staff and staff from Assembly Speaker Anthony Rendon's office (who was also key to AB 249's passage). The final 29-9 vote is shown on the Senate board on the right. After receiving more than 32,000 emails and thousands of calls, an overwhelming bipartisan majority of the Senate voted to pass AB 249, 29-9! Every Democrat voted "Yes", joined by Republican Senators Anthony Cannella and Scott Wilk. That sent AB 249 back to the Assembly floor for the reconciliation vote it needed to reach Governor Brown's desk. AB 249 passes Assembly floor in overwhelming bipartisan 59-15 vote on 9/15! Front page of the Sacramento Bee reports AB 249's victory on the Assembly floor with photo of AB 249 author Assembly Speaker pro Tem Kevin Mullin being congratulated by Assemblymembers Mark Stone, Marc Berman, and Richard Bloom. On the right are CALPIRG's Emily Rusch, Clean Money's Trent Lange, and California Common Cause's Nicolas Heidorn and Jack Blattner shortly after the vote. After passing the Senate floor vote, AB 249 had only four days to pass an Assembly reconciliation vote. Clean Money supporters and coalition partners generated an incredible 10,000+ emails and thousands of calls, combined with in-person lobbying visits from not only California Clean Money Campaign President Trent Lange but also our friends at California Common Cause, CALPIRG, the League of Women Voters of California, the Lutheran Office of Public Policy, and even the California Broadcasters Association. It worked! After stirring speeches by AB 249 author Assembly Speaker pro Tem Kevin Mullin and Assemblymembers Marc Berman, David Chiu, Matt Dababneh, Todd Gloria, Ash Kalra, Marc Levine, Kevin McCarty, Al Muratsuchi, and Sharon Quirk-Silva, AB 249 passed Assembly reconciliation in an overwhelming bipartisan vote of 59-15! Every Democrat voted "Yes", along with Republican Assemblymembers Dante Acosta, Catharine Baker, Tom Lackey, Brian Maienschein, and Mark Steinorth. Republican Assemblymember Steinorth provided the deciding 54th vote, a very positive example for bipartisan reform for the nation. Governor Jerry Brown makes history by signing AB 249 on 10/7! Governor Jerry Brown signed AB 249! The victory came after more than 350 organizations and leaders endorsed AB 249, over 100,000 Californians signed petitions, tens of thousands of Clean Money supporters sent emails, many thousands made phone calls, hundreds packed hearing rooms, and more on a sustained outpouring of grassroots activism. "It is both fitting and unsurprising that this landmark, against-all-odds legislative victory for democracy was won the same way our republic was secured: by thousands and thousands of passionate volunteer Americans who selflessly devoted — as in the final sentence of the Declaration of Independence — 'their lives, their fortunes and their sacred honor' to the cause. Make no mistake about it, this was people power in action and this landmark victory belongs to those countless heroes who made phone calls, wrote emails, made signs, raised small contributions, and raised big hell until the legislature passed AB 249 and Governor Brown signed it." 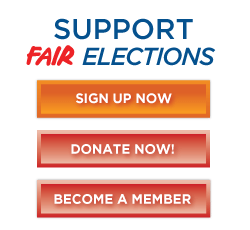 California to Continue Leading Nation Against Big Money — With Your Help! 2017 proved that when we all stand together and demand action — showing by our smart persistence that we will never go away, and that we will hold elected officials accountable — we can change the course of history against all odds with landmark legislation like the California DISCLOSE Act. Now we're building on our victories to fight other ways Big Money dominates politics. First up is passing SB 651, the Petition Disclosure Act that will require paid initiative signature-gatherers to tell voters who's paying for them, stopping bad initiatives from getting on the ballot by hiding who's behind them. Help us keep the momentum going! 1) Become a member of the California Clean Money Action Fund to support our grassroots efforts against Big Money every month! 2) Sign up as a Clean Money Rapid Responder to boost key Clean Money posts on Facebook, Twitter, Reddit, or DailyKos! Thank you again from everybody at California Clean Money for all that you do!